High-tech tracking for a low-tech need. 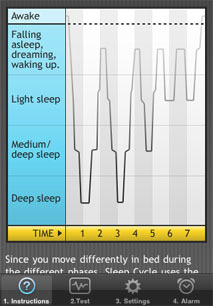 A recent series in the National Post on the quantified self got us thinking about our sleep (or lack thereof). We both have issues, although different, and though it would be a good idea to track our sleep patterns. In seeking an easy journalling device, I came across this nifty iPhone app that is extremely intriguing. Using the accelerometer in the phone, Sleep Cycle tracks your sleep patterns (based on movements in your sleep) and helps you awaken in the morning during light sleep, ostensibly making the morning wake-up easier, less disruptive, leading to a better day (or at least morning). You place the phone upside down on your mattress under the sheet (I use the top corner of my bed) and the during the first couple of nights it calibrates your sleep cycles. You set the alarm (using one of the included gentle sounds to wake you up) and it awakens you in the period up to 30 minutes before the time when it determines you are in light sleep. Here’s an example from the website of what a night of sleep might look like. 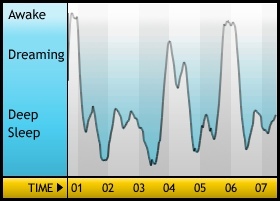 I have used this for two nights and got two very different looking patterns, which makes sense since I had very disrupted sleep last night, compared to the first night. Here’s an example of a good night’s sleep. It also tracks how long you sleep and lets you review your previous nights with a simple swipe of the screen. 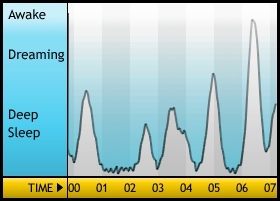 You can also send your sleep graphs via email and (if you so desired) post them to Facebook. Here’s a link to the app in iTunes. For $0.99, it’s a steal. I’ll post my personal gleanings after a few more days of use.